We are excited to announce the Official Launch of HUMBER GBMSA - Global Business Management Association on next Tuesday Jul 18th Tuesday at 6:30 pm - G Building Humber Lakeshore. 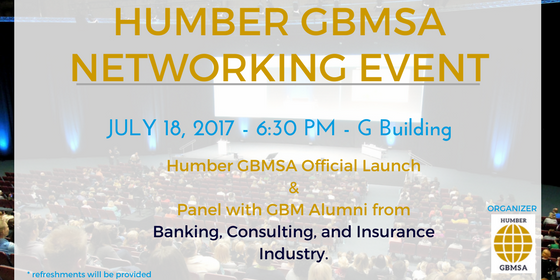 Humber GBMSA – Global Business Student Association is holding a Networking Event with Humber GBM Alumni Panel. It is a great opportunity to chat and learn from Alumni who are currently working in their industry. Do not miss this chance to connect with them. The event is free and open to all Humber programs. Welcome to join and enjoy some informal networking and opportunity to meet professionals, alumni, students and Humber professors and staff.